Aja Jefferson, a freshman at the University of Louisiana at Lafayette, needs to come up with $1,300 more for tuition next semester -- and so do tens of thousands of other Louisiana college students. The cash-strapped state has pulled scholarship funding out from under them, raising their tuition cost for the spring semester to 50% more than they had expected. 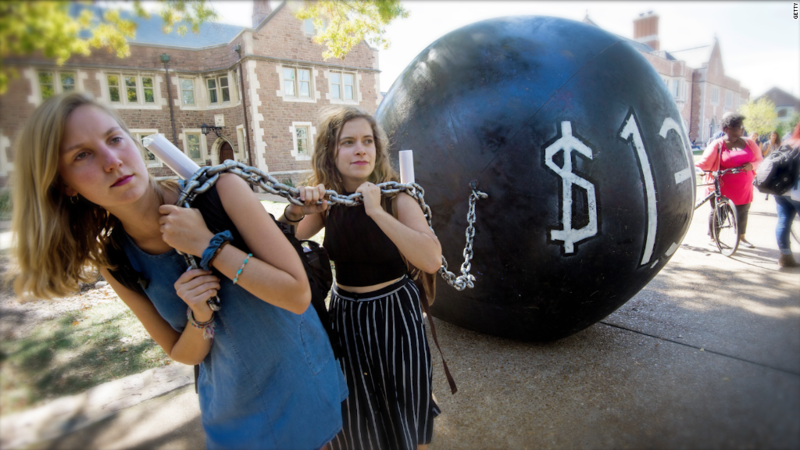 For Jefferson and others, the cut might mean they'll be taking on more student debt. It might mean they need to pick up another job. And for some, it just might put graduation out of reach. "There will be students who drop out. 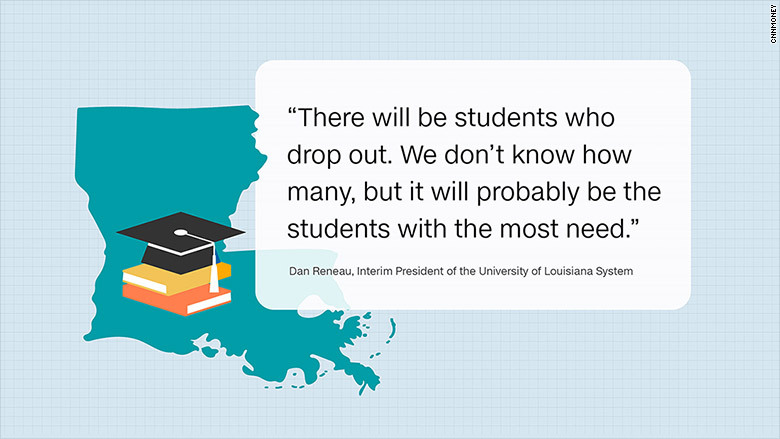 We don't know how many, but it will probably be the students with the most need," said Dan Reneau, the Interim President of the University of Louisiana system who oversees nine universities and 90,000 students. The Taylor Opportunity Program for Students, known as TOPS, is one of the most generous, merit-based state scholarships in the nation. Until now, it covered the entire cost of tuition for Louisiana students as long as they graduated from high school in-state and met two academic requirements: a 2.5 high school GPA in core classes and at least an average standardized test score. Those who attend a public school get enough money to cover the full tuition bill, plus extra for students with higher grades and test scores. Students who go to a private college are also eligible, but the scholarship probably won't cover the entire tuition bill. TOPS is a "great, unique strength of the state" and a "huge benefit" for those students who may not otherwise be able to go to college, said Rhonda Kalifey-Aluise, director of the KIPP charter schools in New Orleans. For Jefferson, it was also a big motivator. "For people in low-income families like me, TOPS is the only thing that can help us go to college. We try to do well and get higher grades just to get TOPS," said Jefferson. The New Orleans native is the first in her family to go to college. Jefferson chose UL Lafayette for its nursing program (she's always wanted to be a nurse) and because she would receive TOPS if she chose this school over one out of state. Across the country, tuition is going up faster than family's incomes while state funding has declined. But the cuts in Louisiana are more severe. Its funding for public colleges has fallen 39% since 2008, more than almost any other state, according to the Center on Budget and Policy Priorities. Meanwhile, tuition rose an average of $3,500 in Louisiana during that time period. It shouldn't have been a surprise that TOPS was the next domino to fall. The state is facing an historic $600 million budget shortfall and needed an emergency legislative session last year to fix the state's finances. It was at that time in the spring when lawmakers said TOPS would not be fully funded for the 2016-2017 school year. They front-loaded the money so that students received nearly what was expected for the current fall semester, but the amount was slashed in half for the spring. Governor John Bel Edwards criticized that tactic for giving "false hope" to Louisiana students and parents that lawmakers would be able to find some more funding before January. They haven't, and the next legislative session doesn't begin until April. "When we heard about the cuts, everyone was so scared that they weren't going to be able to go to college," Jefferson said. That's because many high school students count on getting this money. Going forward, it's unclear what will happen to TOPS. But, legislation that passed in the spring makes it unlikely that awards will get bigger as tuition rises without specific legislative approval. In the past, it automatically matched the cost of tuition. "This changes their strategy. More students will be looking out of state for college," said Kalifey-Aluise. There are dozens of legislative proposals for reforming TOPS, which has grown to cover more students and cost $300 million a year before the cuts. Some proposals keep qualifications more or less the same, but make the scholarship less generous. The Louisiana College Access Coalition is fighting to make sure low-income students continue to receive TOPS. They propose a tiered structure that would give kids from higher-income families less money than those from poor families. This structure, the group says, would save the program money while making sure every qualifying student still gets some money. Others proposals would make it harder for students to qualify for the scholarship, by requiring better grades or taking more classes. Some lawmakers want to keep scholarship amounts equal for every student who makes the grades to receive TOPS. State Senator Dan Morrish, who chairs the Senate Committee on Education, told CNNMoney that the cost of TOPS needs to be contained. He advocates for keeping the scholarships merit-based. "There are lots of other opportunities for need-based students, like Pell Grants, and private scholarship programs. The intent of TOPS has always been merit-based," he said. For now, some colleges and groups like KIPP are working to try to fill in the funding gap for current TOPS recipients who might need it for the spring semester. That will be difficult for colleges that already receive less money from the state. They won't be able to give extra money to every student, or cover the entire cost. Whether or not TOPS will be fully funded next school year won't be decided until after the next legislative session begins in March. Are you hurt by the TOPS cut? Email Katie.Lobosco@cnn.com to share your story.